By now I’m sure you poured over the text of my Palazzo article (posted last week) at least a dozen times (parsing every phrase and mulling every opinion), so hearing me read the thing on Nevada Public Radio may be a bit redundant. Nevertheless, all semi-literate, word-challenged folks, may click here to hear this week’s Food For Thought, heard weekly on News 88.9 FM KNPR, www.knpr.org. RAKU is so good it’s scary. Fresh, pristine, pure Japanese robatayaki cooking like Las Vegas has never seen, and fast becoming a foodie mecca like we’ve never had off the Strip. Uber-seafood chef Paul Bartolotta told me he’s been twelve (12!) times in two months and still isn’t tired of it. We (Food Man, #2 Son of Food Man, and The Food Gal) went last night and tried three desserts (after some pickled Bonito guts, beef liver, cold soba noodles et al), and found the melting chocolate cake to be possibly the best in town – ditto the watermelon grantinee (called sorbet on the menu). Chef/owner Mitsuo Endo told us (through his interpreter – the adorable Risa) that he originally came here to cook in a restaurant in, of all places, Anthem – that bastion of bad taste in Henderson. * Anthem’s loss was the rest of the town’s gain. *** YouTube here I come. Shhhhhh…Don’t tell anyone (let’s just keep this a secret between ourselves shall we? 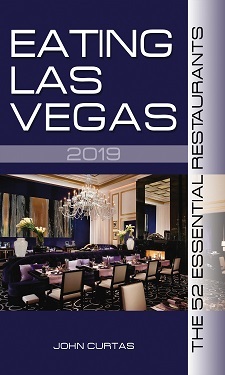 ), but two mega-fabulouso chefs are coming to Las Vegas. Pierre Gagnaire is close to (or has) inked a contract with MGM-Mirage’s CityCenter to open an outpost in the Mandarin Oriental slated to open there next year. Gagnaire is the chef-owner of his eponymous, Michelin 3-star restaurant on the Rue Balzac in Gay* Paree. He also runs outposts in Tokyo and Hong Kong where late last year he fed us the most expensive lunch we’ve ever had atop the Mandarin Oriental in that amazing city….a place where the name just seems to fit a bit better, wouldn’t you agree? Terrance Brennan of Picholine and Artisanal fame (two of our faves in NYC), will be coming to the Echelon project – probably the Shangri-La. ** Brennan has been instrumental in the resurgence of artisanal cheeses in America, and Picholine (as in olive), his Michelin-starred restaurant on the Upper West Side of Manhattan has been a foodie mecca since the mid-90’s. In honor of these announcements, this might be a good time to explicate on what makes Gagnaire’s food so fabulous. Click here for my article – written for www.JohnMariani.com – on my meal at Pierre TT (don’t ask me what that funky TT means – a “P”? Pi? A pie? – but’s it’s on all the matchbooks) in Hong Kong. The article is also Part Three of a travelogue I did on my memorable meals in that strange and wonderful city. Click here and here for Parts One and Two of Eating Hong Kong. ** All prophesies made by ELV come with the Easterbrook Guaruntee: All predictions true or your money back!